The Met Office’s new state of the art building in Exeter Science Park features a large IT hall, which will house a major part of the Met Office’s new supercomputer, one of the most powerful computers in the world and capable of carrying out 16,000 trillion calculations per second, along with a striking two-story ‘collaboration’ building, which will be a home for world-class research into climate change. 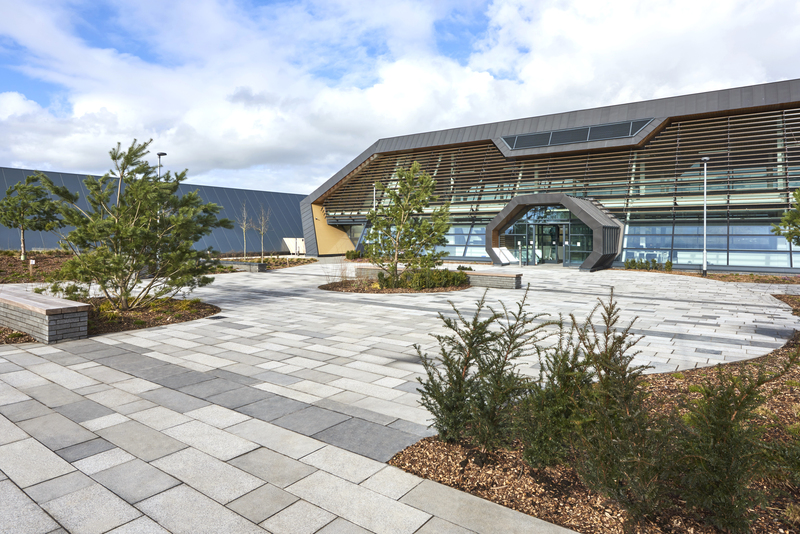 The concept design was developed to embrace the principles set out in the Design Code for the Exeter Science Park, with the aim of the project being to achieve a high quality external space which was accessible to staff and visitors alike on the prominent ridge top location. 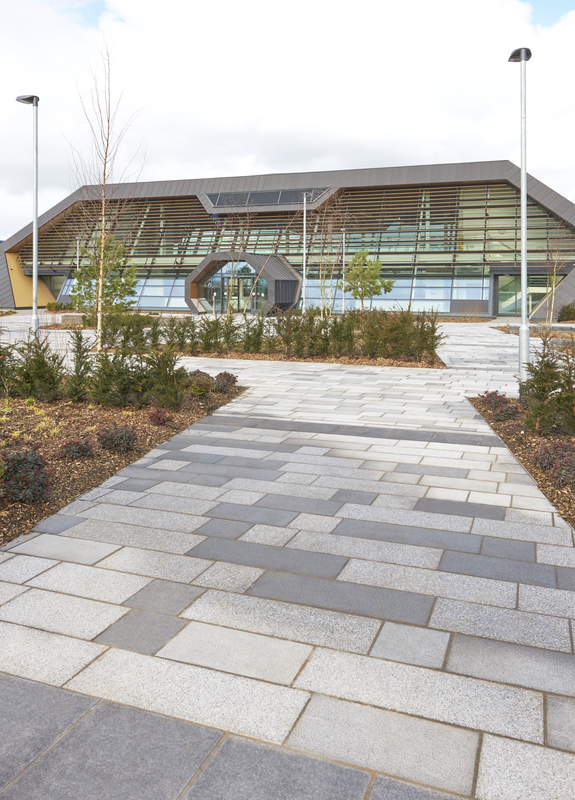 In order to create a contemporary design which blended in with the natural landscape, Marshalls’ assisted the landscape design team in selecting the Prospero, Thalassa and Tritanial granites due to their complimentary tones and textures which matched the contemporary architectural design which juxtaposed with seminaturalised areas of sweeping soft landscaping and semi-mature native tree planting. Freestanding stone ‘groynes’ of varying height and length cut through the soft landscaping to provide a structural spine, adding rhythm and interest to the scheme. 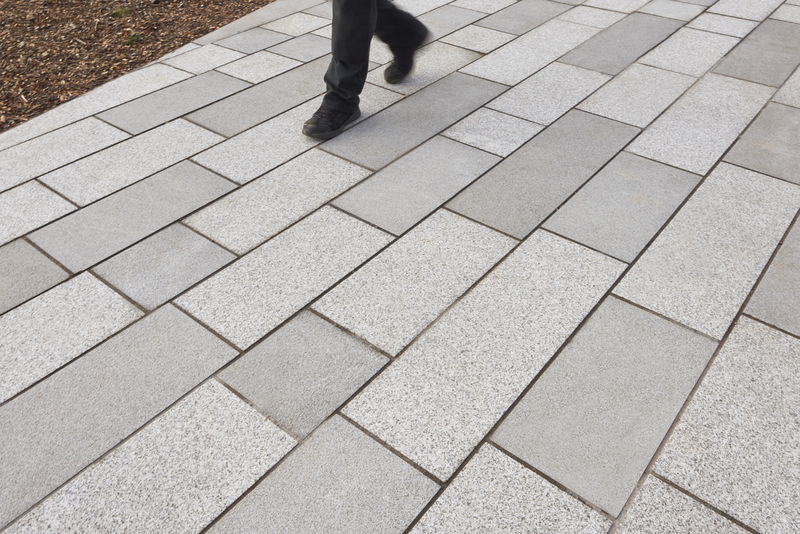 In order to have a sustainable water management structure, the scheme utilised Marshalls’ Grassguard and Priora systems, which both complimented the scheme’s contrast between natural and contemporary aesthetics. Grassguard offered the stability of a concrete base with the aesthetic of natural grass, whereas the Charcoal and Silver Grey Mistral Priora offered permeable benefits, and the exposed granite aggregates mirrored the tones of the other granites used on the scheme, whilst also being suitable to withstand all loading requirements. The final project is a remarkable, contemporary space that not only successfully reflects the natural beauty of the surrounding area, but is also futuristic enough to indicate the astounding technology which is housed within. 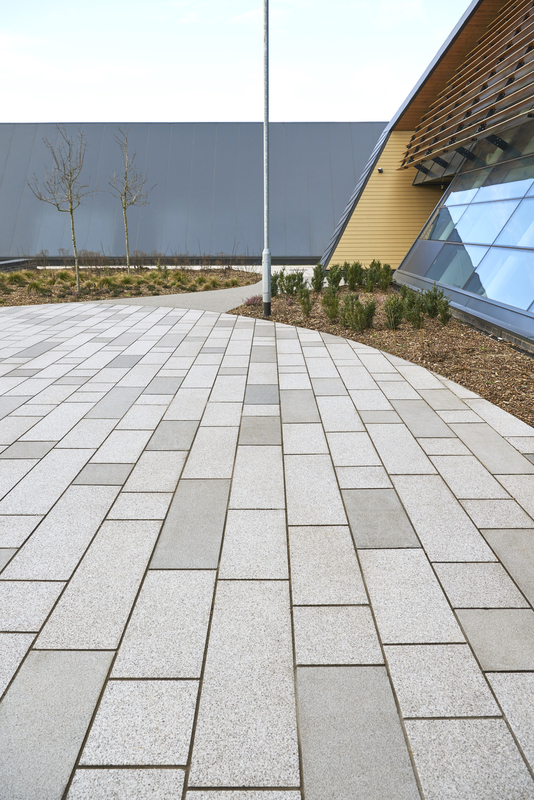 The combination of grey hues formed by a mixture of natural stone, concrete paving and CBP has created a modern icon amid the neighbouring natural greenery.